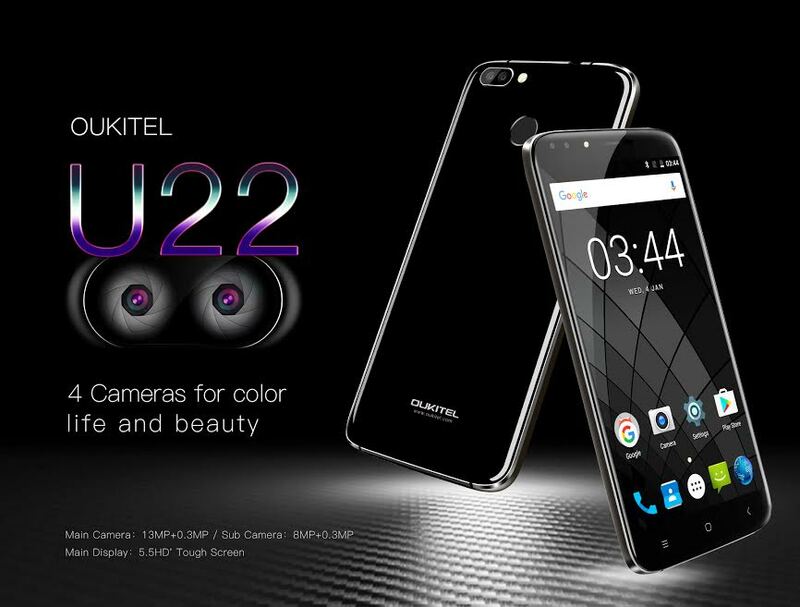 OUKITEL U22 Full Specifications Appear as Release Date Nears for World’s First Phone with Quad Cameras - Playfuldroid! At the start of June, OUKITEL began the pre-orders of the K10000 Pro smartphone. The company is just released a phone in the market and now it is gearing up to launch another phone called OUKITEL U22. It is not just any other smartphone, but it is the world’s first smartphone that features four cameras. The full specifications of the OUKITEL U22 have surfaced which indicates that its release date is fast approaching. When the news about the OUKITEL U22 surfaced in April, it seems that it would be launching soon. However, the Chinese firm delayed its launch probably because of the arrival of OUKITEL K10000 Pro. Now that the K10000 Pro pre-orders are in full swing, it seems that the U22 smartphone would be launching at the end of June. Design-wise, the OUKITEL U22 bears resemblance with iPhone. It features a glossy polycarbonate shell on the rear side. It has a metal frame running along its edges. The USP of the phone is that it features two cameras on the back panel and another pair of cameras at the front. It will be available in two colors like Jet Black and Pearl White. The following video shows how impressive the U22 is in terms of appearance. The OUKITEL U22 is a 3G phone that has a 5.5-inch screen that offers a full HD resolution of 1,920 x 1,080 pixels. It is fueled by 1.3 GHz quad-core processor that belongs to MediaTek MT6580A chipset. The MTK chip is supported by 2 GB of RAM. Its internal storage is 16 GB. The phone comes loaded with Android 7.0 OS. Let’s talk about the UPS of the OUKITEL U22, the quad cameras. The LED enabled front-facing dual camera system includes an 8-megapixel sensor and a 2-megapixel sensor. The dual rear cameras are also enabled with a LED flash. It includes a 13-megapixel sensor and a 2-megapixel sensor. It is packed with a 2,500mAh battery. Other features include rear-mounted fingerprint reader, microSD card slot, 3.5mm audio jack, and v4.0 Bluetooth. To sum up, OUKITEL U22 is a wonderful phone built for people who love to shoot photos. The company will be releasing more information on it on the official website. Impressed by OUKITEL U22? Users can subscribe for it through this link and also participate in a giveaway activity. The Chinese firm will notify the subscribers once the pre-sale of U22 with cheapest pricing begins.